My husband and I went to a dinner recently that had a buffet line. It is pretty hard to stay gluten free at those type of events so I just did the best I could. One of the options was pasta with shrimp primavera. 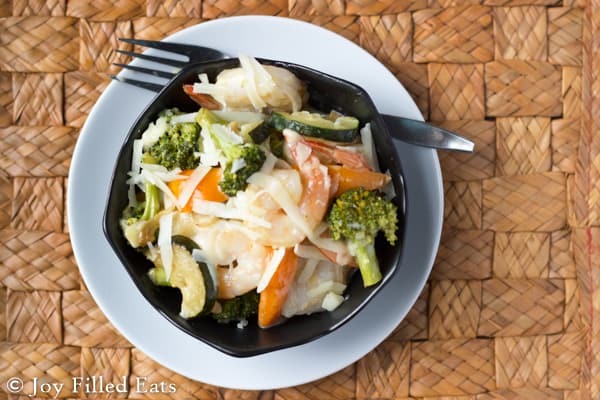 It had linguine, shrimp, and veggies in a cream sauce. It looked amazing. I asked for the woman serving to just give me shrimp and veggies and she was happy to. Later on everyone was invited up for seconds and we were able to serve ourselves. I made sure no one was looking and I picked most of the shrimp out of that pasta dish. I’ve been wanting more since that night. I knew I was going to do shrimp in a similar sauce but with enough veggies to replace the pasta. My version had to be low carb, grain and gluten free, and friendly for the Trim Healthy Mama diet. The frozen shrimp caught my eye in the grocery store last week and I knew it was time. I had all the veggies and the sauce ingredients already. I just needed the shrimp. And since two of the kids were going to be at grandma’s house there were more shrimp to go around. When I had the shrimp cooking and asked my husband to grate the cheese he looked at me oddly and said, “cheese with seafood?” Ummm.. yes! Two bites into dinner he changed his tune and was singing the praises of this simple dish. 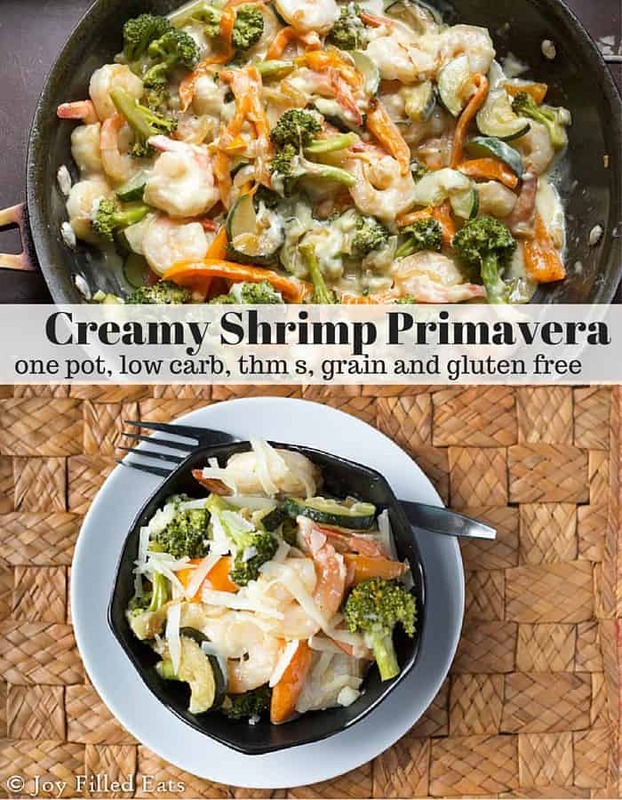 My Creamy Shrimp Primavera is cooked in three stages in the same pan to keep the dirty dishes to a minimum. Cook the veggies, remove to serving bowl. 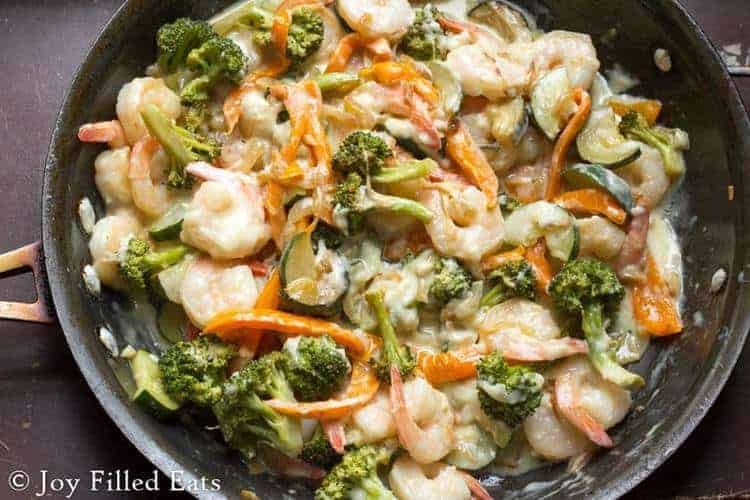 Cook the shrimp, add to the veggies in the serving bowl. Cook the sauce, add back veggies and shrimp. Put all in the serving bowl. Dinner complete. Scroll to the bottom for a printable version of this recipe. In a large frying pan over medium heat cook the onions and peppers until softened. Add the broccoli and zucchini. Cover and cook over medium low for ten minutes or until the broccoli is tender. 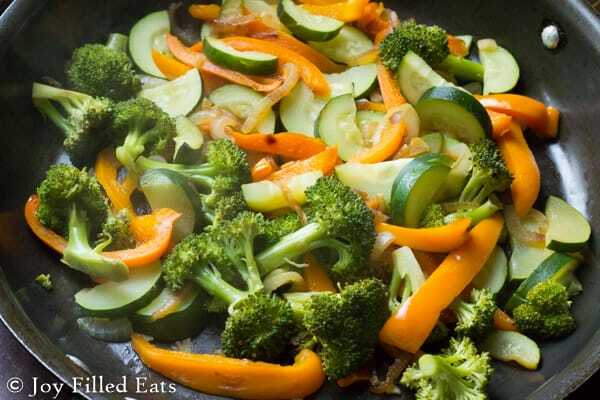 Remove the veggies from the frying pan and put them in a medium sized serving bowl. 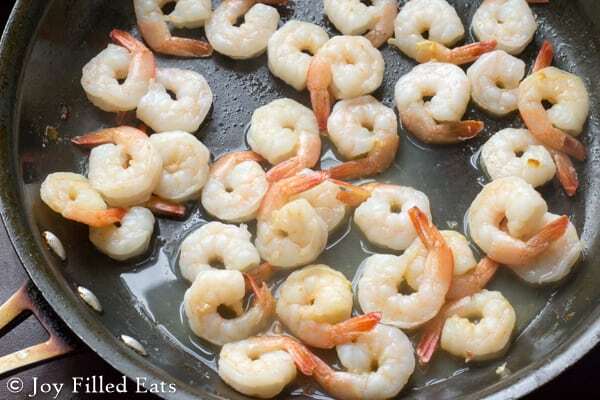 Return the frying pan to the stove and cook the shrimp over medium heat until curled up and pink. Add the shrimp to the bowl with the veggies. 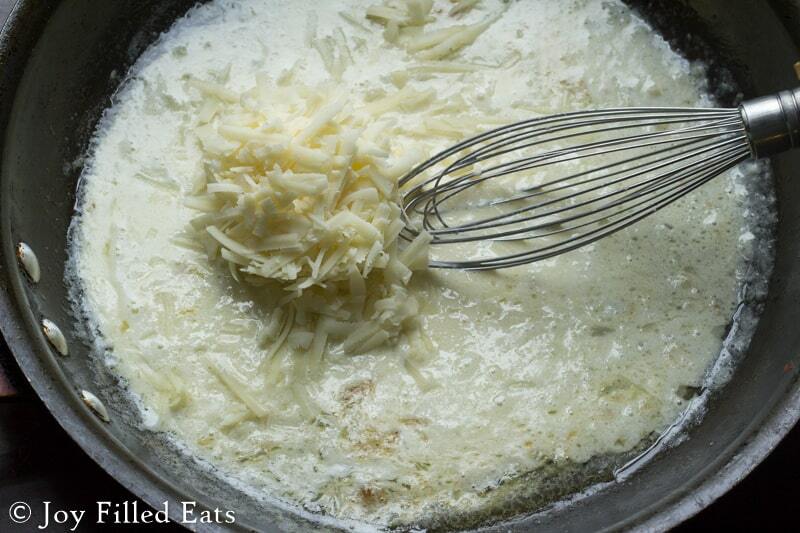 Return the frying pan to the stove and add the butter, cream, and cheese. Cook until the cheese melts. Sprinkle the gluccomannan over the top and whisk in, if using, to thicken the sauce. 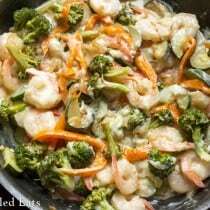 Return the shrimp and veggies to the frying pan and gently fold them into the sauce. Put into individual bowls and sprinkle with extra cheese if desired. 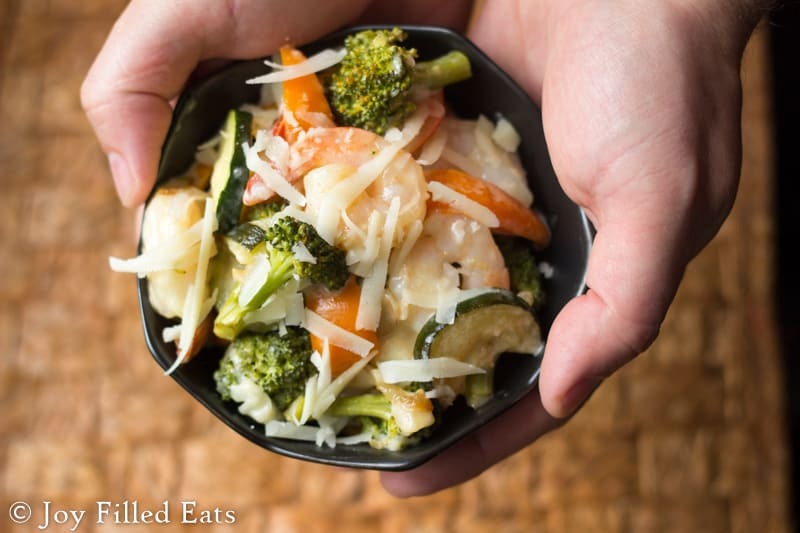 This creamy shrimp primavera is the perfect special occasion family dinner! I would love to cook this recipe. But, I dont understand what to do about the shell and tail of the shrimp??!!. Can someone spell it out for me? Please. Thanks. I buy raw shrimp that do not have a shell. I cook with the tail on and then you take the tail off when eating them. I just found this recipe and made it. All I can say isn’t WOW!! I really like it. I just started low carb and shrimp and Alfredo are my favorite. So combining the two was great! I am printing this off and plan to make very soon. 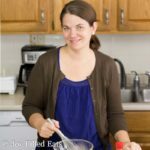 I'm gathering some low carb recipes that sound and look good before I take the big leap. Wish me well. Thank you! Good luck! Low carb is easier than you think. There are so many amazing recipes out there. I cant find the carb totals on the recipes. Can you help me out please. I just added a nutrition box to this one. It has 5 net carbs and 4 servings. I LOVED it but not the Gluccie so much. Textures of foods never bother me but that got a little 'snotty' and I think I will skip it when I make it again. Thank you! Wow, I am an Alfredo addict. This was so great & easy. I'm still amazed that it is an on plan meal. Thanks! I'm glad you liked it! We love shrimp. I want to try this with chicken for a more budget friendly meal.